It may not be your hormones that give you the glow on your face when you are playing with your baby, but it could be the satisfaction, joy and happiness that surely gives you that glow! You knew your baby was going to change everything in your life....But did you know your baby could affect your health positively? Well, after giving this a read, you will probably have a better reason to spend more time with your family and kids! 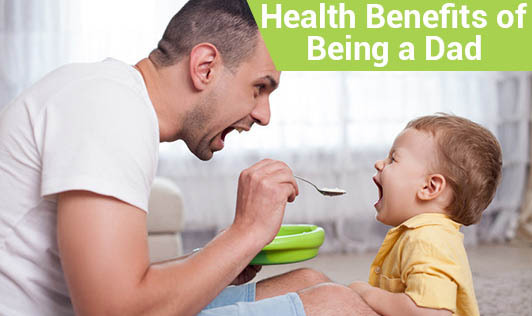 Having a baby is a motivation for every dad to lead a healthy lifestyle. Studies record many new dads to be motivated to eat healthy, exercise more, drink less and put themselves in dangerous situations less often. Experts also say that the transition to fatherhood is a good period for men to break bad habits and establish healthier ones. This is a time when you can notice them becoming more concerned and responsible about their health. For you women, fatherhood may seem like a good idea if you have been trying to get your spouse off the smokes or drinks! Research has it that having a family motivates some men to quit smoking and restrict drinking. It is very important that new fathers quit these habits as babies exposed to second hand smoke are more likely to be colicky, fussy and have respiratory problems. You're desire to be a caring dad and a good role model for your growing child will further add to your motivation to quit these habits. Many studies have found that men who have two or more kids have a lesser chance to develop a heart problem. This could be supported by the above fact that many men are motivated to lead healthier lifestyles, quite smoking, exercise more and drink less when they move into fatherhood. Also, having a baby instils a sense of emotional satisfaction in you. This definitely keeps your heart stronger and healthier. Swedish researchers investigated more than 700,000 men living in a family and found that these men seemed to live longer when compared to men who lived away from their families. Living with a child adds structure, meaning and purpose to life. Having a baby can help you cope with stress. A baby promotes emotional bonding and this can reduce stress related to relationships and work. Having a child expands your social circle by getting you to spend more time with family, friends and neighbours. All these factors help you boost your emotional well being. Also, the more time you spend with your baby, the more satisfied you are with your life. Learn to understand and appreciate every small thing that your little one does. Your child will be an infant, toddler and an adult only once....Capture every moment at the right time for life is beautiful with them around. Is it time to go home already? ?